It's a literary mystery: Nearly 200 years after it was published in New York's Troy Sentinel, we still don't know who really wrote "A Visit from St. Nicholas." When it first appeared in the newspaper on December 23, 1823, there was no name attached to it. It wasn't until 13 years later that Clement Clarke Moore, a professor and poet, was named as the author. A story emerged that a housekeeper had, without Moore’s knowledge, sent the piece—which he had written for his kids—to the newspaper, and in 1844, the poem was officially included in an anthology of Moore's work. The problem? The family of Henry Livingston, Jr., claimed their father had been reciting "A Visit From St. Nicholas" to them for 15 years before it was published. Here's the view from both sides. Also piling up in the case against Moore is the fact that at least four of Livingston's children and even a neighbor girl said they remembered Henry telling them the tale of St. Nick as early as 1807. They even said they had evidence—a dated, handwritten copy of the original poem with revisions and scratch marks all throughout. Unfortunately, the house containing this gem burned down, taking the Livingston family's proof with it. When a professor from Vassar analyzed poetry by both authors, he declared that there was virtually no possible way Moore could have written "A Visit from St. Nicholas." 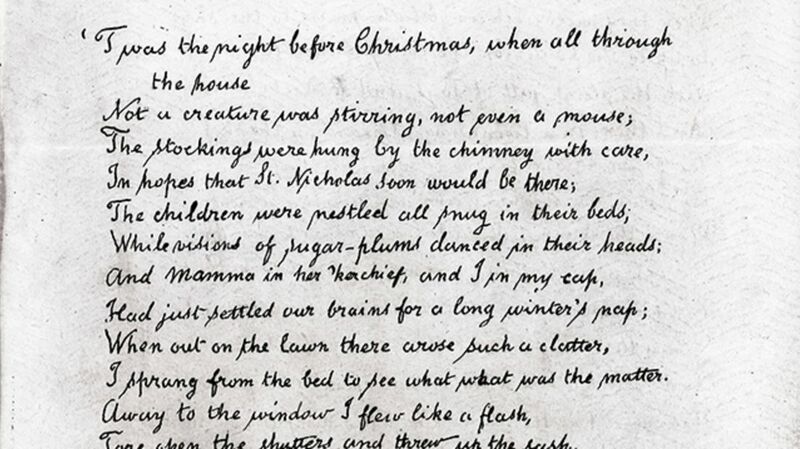 According to the professor, the style of the Christmas favorite was completely different—both structurally and content-wise—than anything else Moore had ever written. But the anapestic scheme used matched up with some of Livingston's work perfectly. Aside from the obvious fact that Moore stepped forward to take credit first, one big key seems to be his relationship with Rip Van Winkle author Washington Irving. In Irving's A History of New York, he referred to St. Nick as "riding over the tops of the trees in that self-same wagon wherein he brings his yearly presents to children." And "when St. Nicholas had smoked his pipe, he twisted it in his hatband, and laying his finger beside his nose," he got in his wagon and disappeared. Familiar, huh? Clement Moore being good friends with Irving might help explain some of the Dutch references in the poem—Irving was quite involved in the Dutch culture and traditions of New York state. There's still no definitive proof for either writer, though. To this day, it's just one family's word against the other's. Clement Clarke Moore is the author who usually gets the credit for the classic, and it will likely remain that way unless Livingston's descendants can prove otherwise. A version of the piece originally ran in 2012.